WF: ICICI Prudential has for long been a strong advocate of asset allocation products. What drives this continued focus? Naren: As a fund house, we believe asset allocation is of paramount importance. Studies too indicate that asset allocation contributes the most to overall portfolio returns. In fact, research* shows that asset allocation accounts to the tune approximately 91.5% of total portfolio return, while selection, timings and other parameter in totality contributes for approximately 8% of total portfolio return. The idea here is when equity market rallies one should be able to capture the rally and when there is a market correction, the potential downside of the portfolio should be limited/capped. In investment parlance, return saved is also return earned. *“Determinants of Portfolio Performance II, An Update” by Gary Brinston, Brian D. Singer and Gilbert L. Beebower, Financial Analysts Journal May-June 1991. WF: Times of market volatility are when most investors take wrong decisions that they later regret – yet the desire to optimize entry and exit across asset classes remains strong. What solutions can you offer to address this need while at the same time protecting the investor from taking emotion driven decisions? How does one decide when a market high is or a low? How can the toggling between asset classes be addressed with minimum operational and transactional hassle? How to address any short term capital gain taxes that may arise? How to keep emotion out of the investment process? We believe the answer and the solution to all of these lies in ICICI Prudential Asset Allocator Fund. This is an open ended fund of funds scheme investing in equity oriented schemes, debt oriented schemes & Gold ETF’s/schemes. WF: What is the fund strategy for the underlying Schemes - ICICI Prudential Large & Midcap Fund and ICICI Prudential All Seasons Bond Fund? Naren: In case of ICICI Prudential Large & Midcap Fund, the portfolio consists of atleast 35% in largecap and 35% in midcap Companies. This fund structure ensures proper diversification across market cap which limits any fund manager bias towards any particular market capitalisation. Similarly, ICICI Prudential All Seasons Bond Fund is a model based debt fund. The model followed provides direction regarding economic cycles, thereby aiding the process of taking a call on duration/accrual for the scheme. In both the underlying schemes, the room for fund manager bias is limited owing to the fund structure. In effect, both the asset class allocation and on a Scheme level as well, the decision is largely model based in its approach. WF: On what basis is the allocation between the asset classes decided? Naren: The scheme can allocate upto 100% in equity funds in extremely cheap markets while it can invest 100% in debt funds in extremely expensive markets. In order to decide on the equity allocation, the scheme uses an in-house equity valuation index to decide how much percentage of the portfolio should be invested in equity or debt. 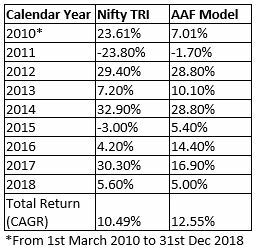 When it comes to the performance of the strategy followed, based on back testing, with data starting from March 2010 to March 2019, it can be seen that the asset allocation model have generated a return of 12.4% CAGR while Nifty 50 TRI return was at 11.1% CAGR. However, the important point to note here is that this performance was delivered with average equity allocation of just 42%. The alpha generated was owing to changing the asset allocation prudently, in the period under review. * In house equity valuation index model has been used for calculation purpose which is being used for managing ICICI Prudential Asset Allocator fund & from 4th Feb 2019 actual fund NAV has been taken. Past performance may or may not sustain in future. Source: Internal. The above allocation is for understanding the in-house allocation model. The asset allocation and investment strategy will be as per Scheme Information Document. The returns are absolute returns. Period considered: March 31, 2010 to March 29, 2019. The performance of the model does not represent the performance of the scheme. The performance of the scheme is benchmarked to the Total Return variant of the Index. The information contained herein is solely for private circulation for reading/understanding of registered advisors/distributors and should not be circulated to investors/prospective investors. * In house equity valuation index model has been used for calculation purpose which is being used for managing ICICI Prudential Asset Allocator fund & from 4th Feb 2019 actual fund NAV has been taken Past performance may or may not sustain in future. Source: Internal. The above allocation is for understanding the in-house allocation model. The asset allocation and investment strategy will be as per Scheme Information Document. The returns are absolute returns. Period considered: March 1, 2010 to March 2, 2019. The performance of the model does not represent the performance of the scheme. The performance of the scheme is benchmarked to the Total Return variant of the Index. WF: How has the model performed through various market phases? Naren: For ease of understanding we are taking four scenarios under consideration – a bull phase, a bear phase, a sideways market and when the benchmark index has generated 0% return. Source: MFIE & Internal. Past performance may or may not be sustained in future. Data as on 29-Mar-2019. The performance of the scheme is benchmarked to the Total Return variant of the Index. * In house equity valuation index model has been used for calculation purpose which is being used for managing ICICI Prudential Asset Allocator fund & from 4th feb 2019 actual fund NAV has been taken, In house equity valuation index has been used for calculation purpose which has being used for managing ICICI Prudential Asset Allocator fund Source: MFIE. Past performance may or may not be sustained in future. The performance of the scheme is benchmarked to the Total Return variant of the Index.^Round off number. * In house equity valuation index model has been used for calculation purpose which is being used for managing ICICI Prudential Asset Allocator fund & from 4th Feb 2019 actual fund NAV has been taken. Past performance may or may not sustain in future. Source: Internal. The above allocation is for understanding the in-house Model. The asset allocation and investment strategy will be as per Scheme Information Document. The performance of the scheme is benchmarked to the Total Return variant of the Index. The performance of the model does not represent the performance of the scheme. WF: What according to you are the salient features of this Scheme which should be considered by a potential investor? 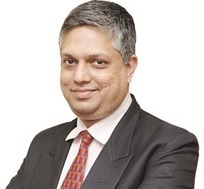 Naren: We believe what sets apart ICICI Prudential Asset Allocator Fund from the existing schemes in the market is its model oriented approach towards asset allocation. Moreover, the model used is that of a relative valuation based dynamic asset allocation which helps decide whether to invest in equity or debt asset class. Secondly, such an approach to investing ensures that the volatility in return is reduced while optimising every market opportunity available across the asset classes. Lastly, by investing in this scheme one can be rest assured that the investment process is scientifically driven by a model rather than any possible emotional or fund manager bias. So, for a market novice, by opting for this scheme, the investor can be well on his/her journey to a hassle free wealth creation. WF: How does this model’s asset allocation differ from BAF’s allocations? Can you please share data for both alternatives over the last 5 years? 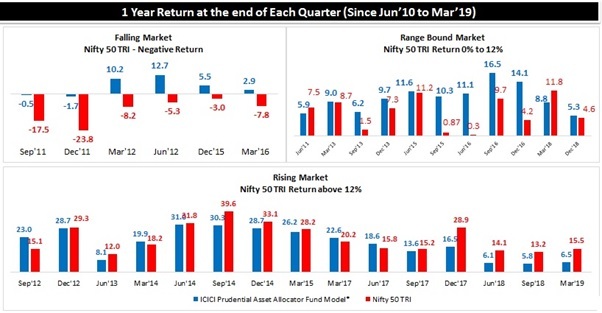 Naren: ICICI Prudential Asset Allocator Fund looks into the relative valuations of both debt and equity (Equity Valuation Index) while ICICI Prudential Balanced Advantage Fund takes into consideration valuations in the equity market (P/B model). The above mentioned strategies are complementary in nature and hence investing in a combination of both schemes could lead to better risk-adjusted returns. AAF – ICICI Prudential Asset Allocator Fund. Past performance may or may not sustain in future. Source: Internal. The asset allocation and investment strategy will be as per Scheme Information Document. The performance of the scheme is benchmarked to the Total Return variant of the Index. 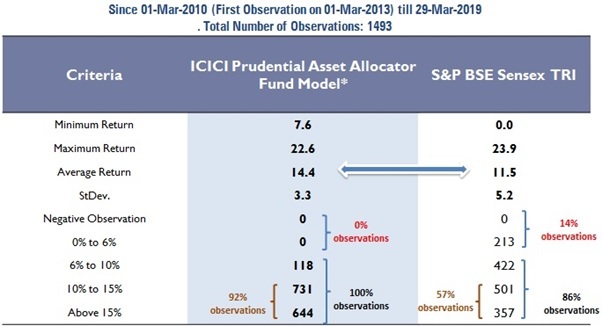 The performance of the model does not represent the performance of the ICICI Prudential Asset Allocator Fund. The information is only for distributors and Advisors of ICICI Prudential AMC and the same should not be circulated to investors/prospective investors. All data/information used in the preparation of this communication is specific to a time and may or may not be relevant in future post issuance of this communication. ICICI Prudential Asset Management Company Limited (the AMC) takes no responsibility of updating any data/information in this communication from time to time. The AMC (including its affiliates), ICICI Prudential Mutual Fund (the Fund), ICICI Prudential Trust Limited (the Trust) and any of its officers, directors, personnel and employees, shall not liable for any loss, damage of any nature, including but not limited to direct, indirect, punitive, special, exemplary, consequential, as also any loss of profit in any way arising from the use of this communication in any manner. Nothing contained in this communication shall be construed to be an investment advice or an assurance of the benefits of investing in the any of the Schemes of the Fund. Recipient alone shall be fully responsible for any decision taken on the basis of this document.